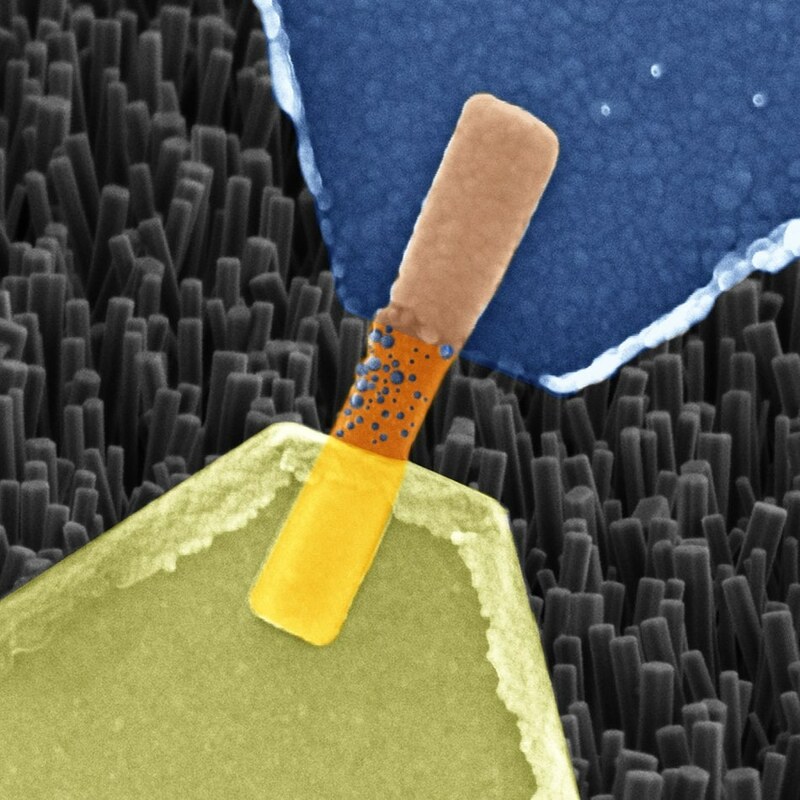 Researchers from Forschungszentrum Jülich, along with colleagues from Turin and Aachen, have successfully created a nanowire-based memristive element that works in relatively the same manner as a biological nerve cell. The component has the ability to both save and process data, and can also receive various signals in parallel. Designed from oxide crystal nanowires, the resistive switching cell has been shown to be the perfect solution for creating bioinspired “neuromorphic” processors, capable of taking over the varied functions of biological neurons and synapses. In the recent past, computers have certainly learned a lot. Due to rapid advancements in artificial intelligence, computers now have the ability to translate texts, drive cars, and defeat world champions at chess, to name a few. While doing so, the effort to artificially simulate the signal processing in the human brain represents a major challenge. Data in neural networks are stored and processed to an extreme degree in parallel. On the other hand, conventional computers quickly work through tasks successively and evidently differentiate between the processing and storing of data. Generally, neural networks can only be reproduced in a highly inefficient and cumbersome manner through traditional hardware. Systems featuring neuromorphic chips that mimic the workings of the human brain provide considerable benefits. According to experts in the field, this kind of bioinspired computer has the ability to operate in a decentralized manner, and have a host of processors that, similar to neurons in the brain, are joined to one another through networks. If a processor malfunctions, another one will take over its function. Furthermore, similar to the brain, where practice results in a better signal transfer, a bioinspired processor should have the capability to learn. With today’s semiconductor technology, these functions are to some extent already achievable. These systems are however suitable for particular applications and require a lot of space and energy. Our nanowire devices made from zinc oxide crystals can inherently process and even store information, as well as being extremely small and energy efficient. For decades, it has been established that memristive cells have the best options of being able to take over the function of synapses and neurons in bioinspired computers. They modify their electrical resistance based on the direction and intensity of the electricity flowing through them. Moreover, their last resistance value stays intact even when the electricity is turned off, unlike traditional transistors. Therefore, memristors are essentially capable of learning. To produce these properties, researchers at RWTH Aachen University and Forschungszentrum Jülich utilized one zinc oxide nanowire, which was created by their colleagues from the polytechnic university based in Turin. This type of nanowire, which measures about ten-thousandth of a millimeter in size, is more than a thousand times thinner than a single strand of human hair. The memristive component, thus obtained, not only occupies a small amount of space but also switches quite faster than flash memory. Compared to other solids, nanowires provide potential new physical properties and are applied in the development of innovative types of computer chips, solar cells, batteries, and sensors, among other things. It is relatively simple to produce nanowires, which result when specified materials are deposited onto an appropriate substrate through evaporation, almost growing of their own accord. To develop a functioning cell, each end of the nanowire should be joined to appropriate metals, in this case, silver and platinum. The metals work as electrodes and also discharge ions activated by a suitable electric current. In addition, the metal ions have the ability to spread over the wire surface and create a bridge to modify its conductivity. However, components developed from single nanowires are still too isolated and hence cannot be practically applied to chips. As a result, Jülich and Turin teams are planning to create and examine a memristive element that contains a larger group of several hundred nanowires that are comparatively easy to produce and provide more interesting functionalities.